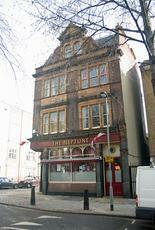 I believe the Neptune has served it's last pint, some time ago. Perfectly reasonable pub. Proper estate pub, friendly landlord and a massive dog. There should be more pubs like this. Disappointing. It looks reasonably nice from the outside, but on the inside is a *very* unreconstructed estate pub where as another poster advises you wouldn't want to speak out of turn. Some very loud and not very pleasant locals were in there when I visited, and the industrial-grade language means that this place pips the Enkel Arms in Holloway as the most obscene London pub I have been in! I don't often get intimidated in London pubs, but I felt glad to get away from here, and couldn't advise anyone else visit it. This is certainly not a pub that you would actively seek out or take the misses to for a cosy drink, but it�s not that bad for an estate pub in this dodgy area. There are a couple of bitters on draught and four or so standard lagers alongside Guinness. There were a couple of Elvis tracks playing during my visit and there is also an old TV, which was off. The barman was nice enough and the locals seemed ok, but this is not a place that I would advise speaking out of turn. I would probably not bother with here again. Good locals' boozer; every time someone walked in he or she was greeted by the other drinkers and the very pleasant Staffie that had free rein of the place. Charles Wells own it, so it's a bit disappointing that there's no handpulls on, but there's others nearby that cover those bases, and the regulars seem quite happy with the lager/football/quiet chat formula that the Neptune provides. As another plus, it doesn't have that sterile waiting room feel about it that a lot of pubs near stations have - the Neptune has been lived in, has probably seen a fair bit of naughtiness and a lot of good days too. Will it be here in ten years? Probably not, the developers undoubtedly have their eyes on it. If it is, would I drink there again? Despite the lack of the real stuff, yes.